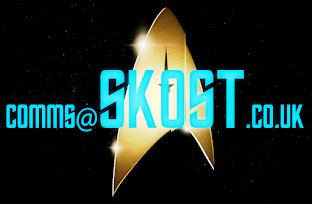 Some Kind of Star Trek: A Pivotal "Unification"? 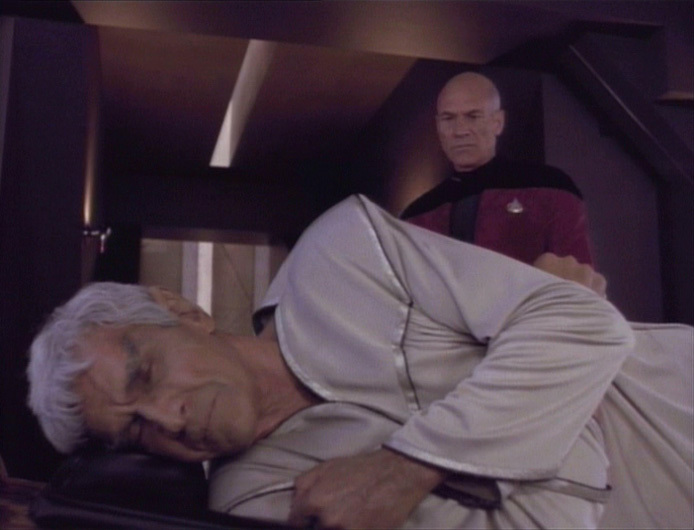 Spock: In your own way you are as stubborn as another captain of the Enterprise I once knew. I remember the first time I saw "Unification" was rented from a local Ritz video shop of the TV movie version during a school summer holiday in 1992. At the time I found it boring, drawn out and a little confusing; but then I hadn't seen much of the fourth season and it wasn't the most action-packed installment I had seen. I managed to watch it all the way through and in conclusion it was OK; nothing particularly special considering this was the seminal 25th Anniversary moment where The Next Generation finally shook hands with its predecessor and acknowledged its past openly. The second time I saw it was in two-part format over two weeks on BBC 2 probably a few years later after it had been rerun on SKY One and I'd missed it. Still I didn't see anything special but now, as I relive the seven seasons of TNG in order I have found a new understanding of the story and would argue that now "Unification" is probably one of the most important moments in Star Trek history. I'm not a big fan of plot summarising as there are plenty of sites and books out there that do it brilliantly but here it is in a nutshell for those of you who might need a refresh. 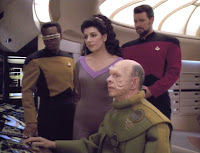 Starfleet believes that Ambassador Spock has defected to Romulus and get Picard and Data to go undercover on the Romulan homeworld to investigate. 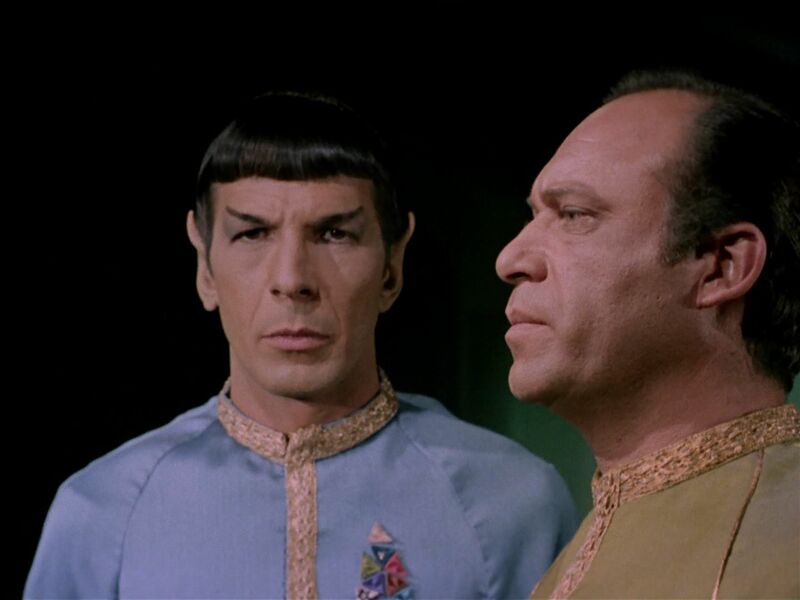 They make contact and discover that Spock is actually looking to work on reunifying the Vulcan and Romulan peoples after many centuries of separation. 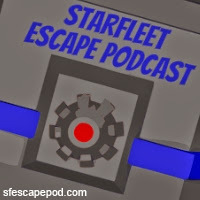 Meanwhile Riker and the Enterprise are following a lead on some debris that leads them to a Federation salvage yard and a missing Vulcan ship. 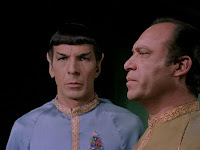 Ultimately it becomes apparent that the two incidents are linked and with the reappearance of Commander Sela we learn that it's all to do with the Romulans using Spock's reunification plan to cover up an invasion attempt. 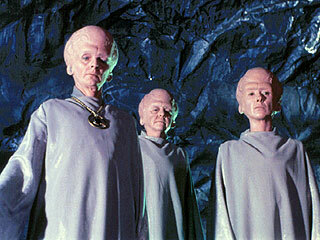 Needless to say it's foiled by Picard, Data and Spock and all is well in the universe once more. So why has my opinion of this story changed in the 22 years since it aired? 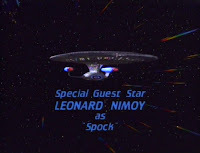 I think "Unification" is a cornerstone firstly because of the arrival of Leonard Nimoy as Spock. 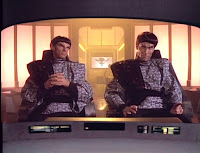 While we had a fleeting meeting with McCoy in the pilot and Sarek in the eponymous third season episode, this marked the true acknowledgement of the original series and their part in the history of the franchise. Of course this came at the time around the promotion of Star Trek VI and the story references Spock's part in the Khitomer Conference on several occasions which acts as a nice tie-in to "historical" Star Trek events. 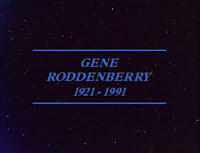 Symbolically "Unification" is a torch-passing moment not only for this appearance but also because it was dedicated to the Great Bird of the Galaxy, Gene Roddenberry, who passed away shortly before it aired. His influence on the series would be no more and his legacy would be firmly in the hands of those he had worked with since the first thoughts of Trek's return in the 80's. 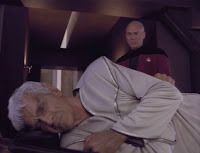 As within the episode we lose the father-figure role of Sarek to his long-term debilitating illness so the man who had brought the series to light back in the 1960's also took his final bow. 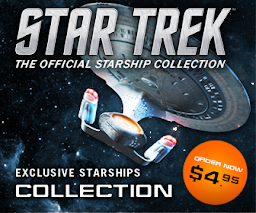 What I do think is fitting here is that we have almost every major race up to this point in Trek history making an appearance (except the Borg of course) - the Klingons help deliver Picard and Data to Romulus, the Vulcans are here (which is not a common occurrence;the Romulans play host of course; we have a Ferengi mercenary who rubs Riker up the wrong way and there's even a Zakdorn thrown in for good measure. The Klingons even manage to get one of their older K'Tinga class cruisers a cameo part at the salvage yard if you keep your eyes peeled. 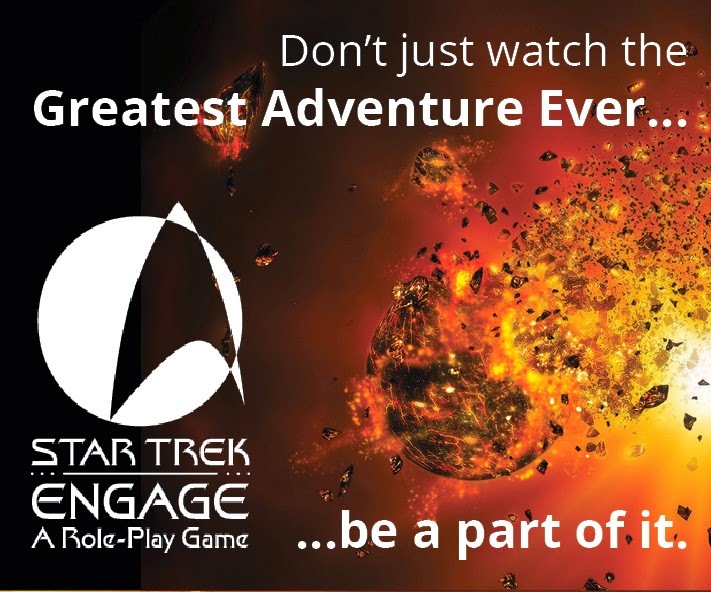 Oh yes - while we're mentioning links to TOS, the name of that Vulcan transport that Riker and the Enterprise are so keen to find? The T'Pau - a freighter and also the name of a certain priestess who presided over proceedings during the TOS second season classic, "Amok Time". 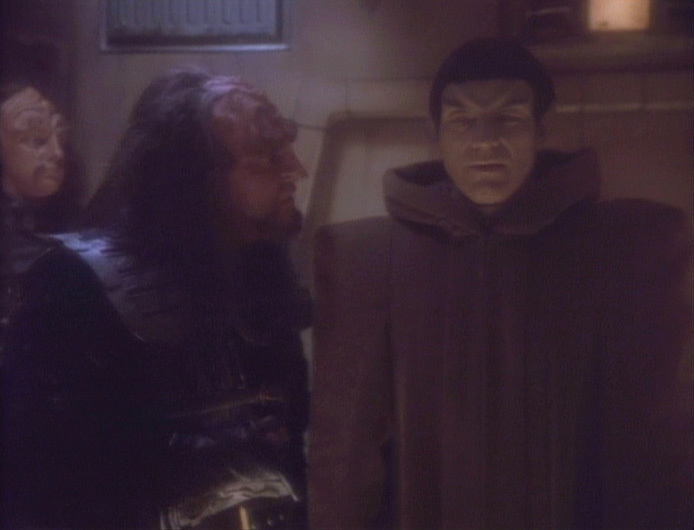 Unless I'm mistaken the next time we would get major races together in one episode would be "The Chase" in season six however the Cardassians would taken the place of the Vulcans. 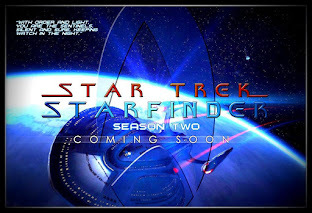 In Trek terms that's probably more in line with the way the series was progressing and the franchise would develop particularly with note to Deep Space Nine. 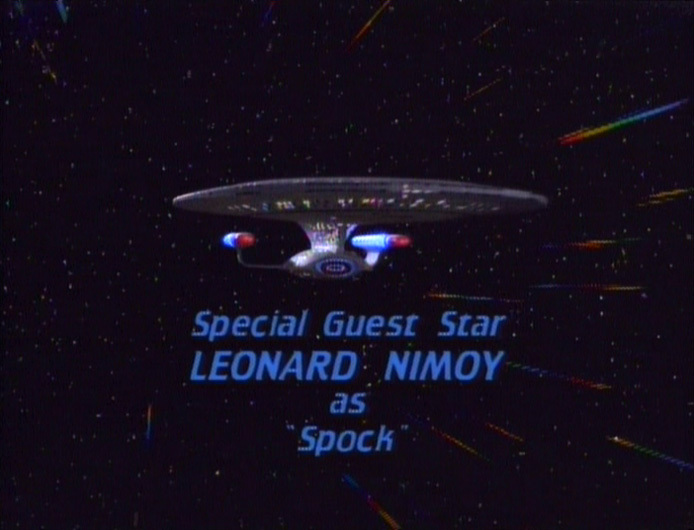 In fact, "Unification" is very much about pulling the two series of TOS and TNG together through Spock's addition but there are also a couple of other notable guest stars here with at least one getting majorly overlooked. 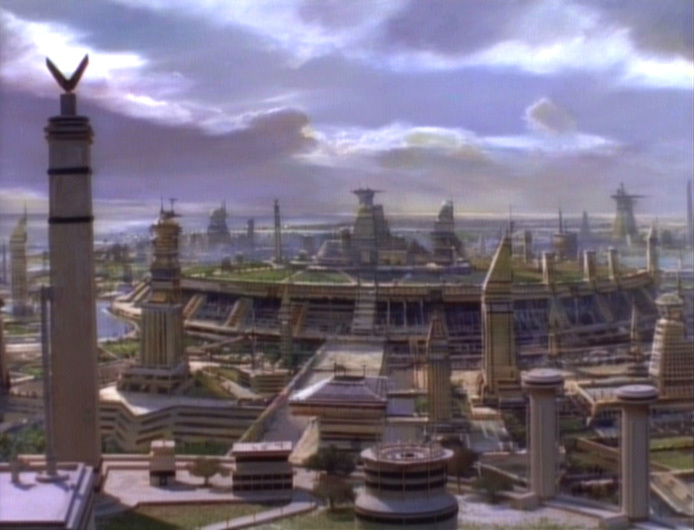 which draw on Trek history even more closely than you may appreciate. 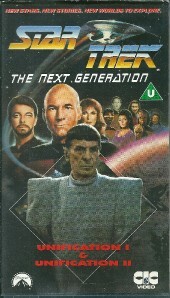 Commander Sela makes her second and final appearance in TNG and returns Denise Crosby for the third of her four post-death roles (the next is "All Good Things...") ensuring that all of the original crew from TNG are represented in some form but it is Spock's Romulan friend, Senator Pardek who intrigues me the most here. 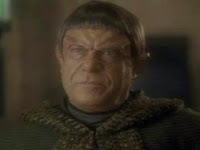 Played by Malachi Throne, Pardek turns out to be in league with Sela and part of the conspiracy to invade Vulcan but Throne's history with Trek is just as interesting and he has crossed paths with Spock before providing the two-parter with another link to its acclaimed past. Throne's voice was used for the lead Talosian in the original pilot "The Cage" and then he featured as Commodore Mendez in the reworking of that very episode, "The Menagerie" which was, of course, the only two part installment of the classic Star Trek series. 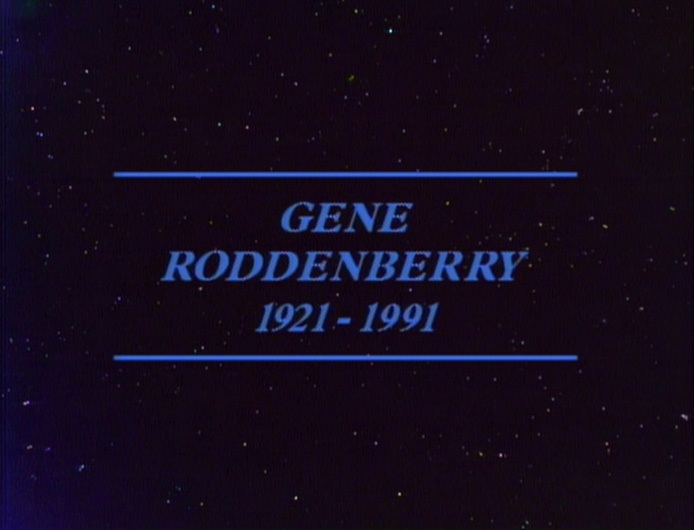 Rather fitting then that he should be here, in a two part TNG story with Spock! "Unification" also acts as something of a precursor to the events of Deep Space Nine and Nemesis in the way that there is hope of the Romulans being accepted as an ally rather than an enemy which they have been since "Balance of Terror" in Kirk's era. 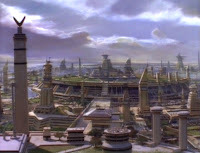 The very possibility that there is hope here may turn out to be a ruse but the seed is planted for future developments; the twist eventually being that they have to join with the Federation to defeat the Dominion and then in the final Prime Universe film the concept of peace initially would be a ruse to tempt Picard to cross the Neutral Zone. For years we have seen the Romulans as hostile and indeed that is how they were introduced back in Season One's "The Neutral Zone" but here we get the hint that not all Romulans are the same and there are some that would welcome a more peaceful future. Lest we also forget that this is the first time since Trek records began that we have seen Romulus AND get to set foot on it too. Spock: Fascinating. You have an efficient intellect, superior physical skills, no emotional impediments. 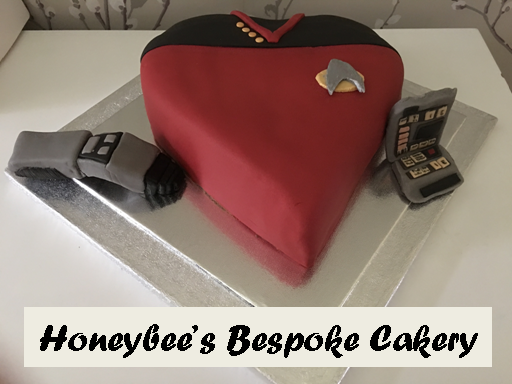 There are Vulcans who aspire all their lives to achieve what you have been given by design. 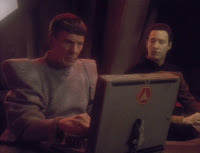 Data: Yet you have chosen a Vulcan way of life? Data: In effect, you have abandoned what I have sought all my life. It's the realisation that while they are both exploring the human condition they are hitting it from quite opposing angles and coming to massively different conclusions. Logic has dictated both their paths yet they are truly unique characters who allowed us to see humanity for the flawed species we are! In essence this is TNG saying that while it recognised it's history it was very much its own series with its own views, direction and beliefs. This truly is an occasion where the new generation is finally at ease with its past. 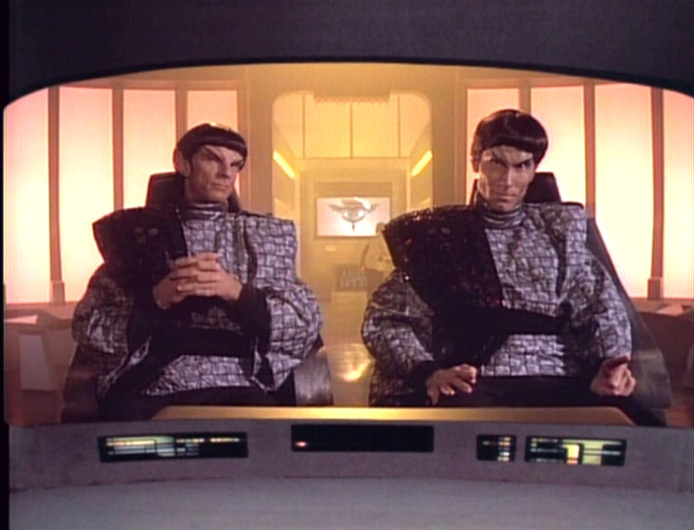 Indeed it's well known that the writers had to fight to get a reference to Spock into the script of "Sarek". 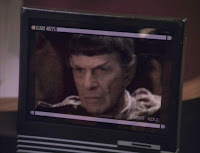 McCoy was unnamed in "Encounter at Farpoint" and "The Naked Now" retrod ground perhaps a little too familiar too early. Here we are in the presence of celebration and acknowledgement for the 25th Anniversary as was. So 22 years has made a lot of difference. Once an episode that I had little love for is now one I would treasure to watch again. 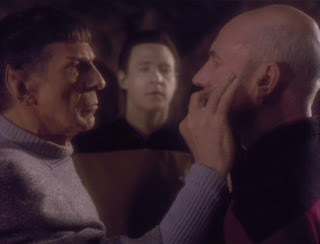 "Unification" is a moment captured and an occasion for TNG to be proud of and at such a maturing stage of its life. 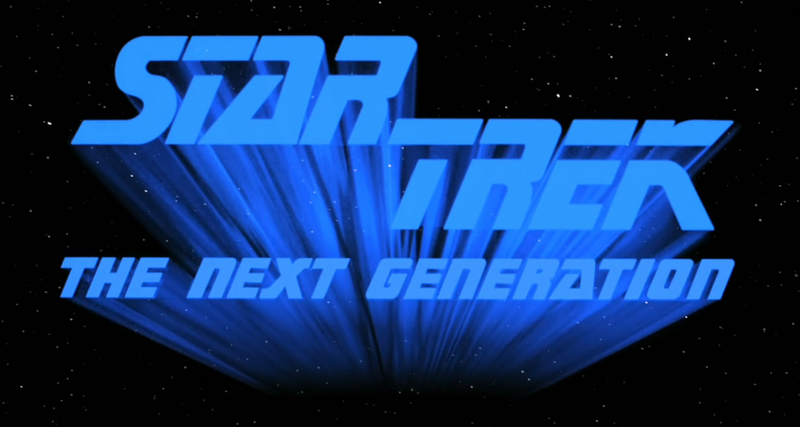 While it's not the most action-packed Trek of all time I do think it can hold its head high as one of the best installments in it's lengthy history if only for its unifying factor not only potentially between Romulans and Vulcans but also Star Trek generations.